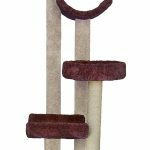 Give your cats a fun structure of their own in this 62 inch tall cat tree by Armarkat that they can use for both sleep and play. We like the simplicity in the design and the fact that there are large platforms and a variety of features in this sturdy structure. It’s not as tall or crazy looking as a couple of the other cat trees we’ve looked at, but it’s a very good design that your cats will love. Let’s take a quick look at what is all available for your cats in this structure. It has a sturdy base that is 36 inches by 20 inches in size. The bottom level contains 3 scratching posts (sisal-wrapped) and a hammock. The second level contains two scratching posts, a rope and a condo. The third level is a large platform and a scratching post. The top level is a platform (with sides) and a tube-shaped cubby underneath. 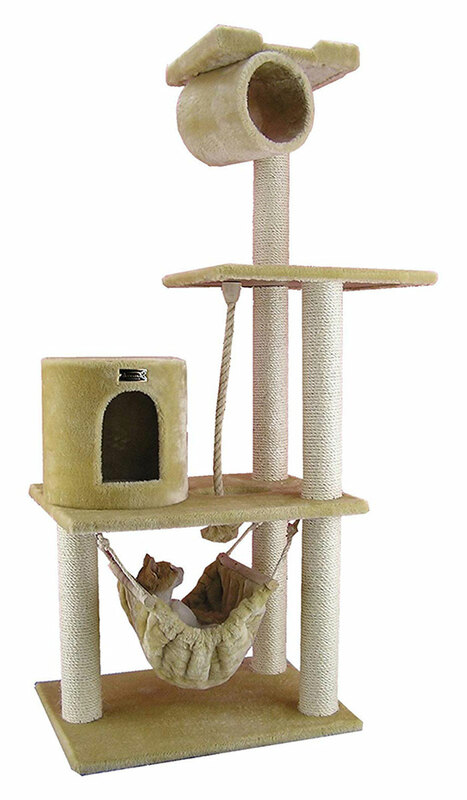 This cat tree is built out of pressed wood and is covered in beige faux fur. The faux fur is soft and cats love it. It is also easy to clean, which is an added bonus. This is a very sturdy cat tree as well, it weighs 45 pounds when set up. 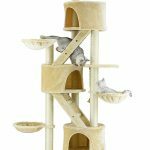 The buyers of this cat tree find that it is very easy to set up and that their cats love it! All of the reviews on Amazon are 4 or 5 star reviews. People that have had cat scratching problems often find that the scratching posts on this are very attractive for their cats. It’s probably due to the sisal wrapped posts, which are considered better than carpeted posts and can be more attractive to cats for scratching. Some buyers mention that they didn’t think their cats would like a cat tree, but found out the opposite in a hurry! There are a lot of stories about how their cats play, wrestle and sleep on these towers. One negative point about this cat tree is that some buyers found it to be a bit wobbly. One reviewer who had a larger cat said that the top wobbled quite a bit when the cat was way up top. Some others mentioned similar effects. It might be best to try to find a way to give the base a little more sturdiness, such as securing it to the floor or wall, if you experience this sort of thing with this cat tree. What about assembly? People who buy this cat tree say that it is very easy to assemble, some say that they assembled it in less than 20 minutes. That is pretty quick, we won’t deny, so if you like stuff that is pretty easy to put together, the cat condos from Armarkat would be a good choice because they are all easy to put together. Hey I must say I didn’t really know what to make of these Armarkat condos, since I’m not a big fan of assembly, but I was wrong and my skepticism was a little unbased. After setting this up I gotta say I’m pretty impressed. My cats are too they really like it.